﻿ 5 Best KitchenAid Stand Mixers of 2016: Which One Is For You? You want the best KitchenAid stand mixer. But do you sometimes feel that you can’t wrap your head around the features, benefits, and drawbacks of the different models? We understand your confusion. Some models are almost the same, it’s hard to pick. Going through the features of each one and evaluating the information you gather requires thorough research and demands a chunk of your time. You want a list that’s been thoroughly researched, honestly evaluated and narrowed down to a few best. After days of digging, comparing and evaluating, we present the 5 best KitchenAid stand mixers for the home. 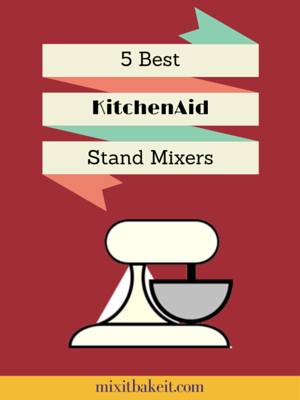 This is not the typical “Best KitchenAid Stand Mixers” list you see online. One that before you even look at, you already know what model is on top. Yeah, almost all the “best”lists have the same famous model as their top pick. Our picks are grounded on merits. Firstly, we let you know the main Pros and Cons of each mixer in the list. Secondly, we summarize what’s good and not good about them, and why they made it to this selections. Thirdly, we list their important features side by side on a Table. Lastly, we discuss what we looked at and how we evaluated which you can use as a guide in case you decide to research further. In addition, we lead you to our full reviews of each mixer. These are detailed and comprehensive reviews which are loaded with information including little-known facts. Scroll down now to find out which ones made it. The Pro Line is also tops because of its powerful DC motor that plows through the toughest tasks. It is steady, maintains a consistent speed, runs smoothly does not stall, wobble or rock. Despite its heft and big motor, it is one of the quietest stand mixers around. No problem conversing with hubby over the hum of the machine. It has a big 7-quart bowl sufficient for multiple recipes of cakes, cookies, pizza dough, bread, you name it. You can also get a separate 3-quart or 5-quart bowl for smaller quantities. Although its bowl size and power is most suitable for bigger volumes and denser mixtures, it works just as well for small amounts. But you most likely won’t prep and use such a hefty machine to whip a cup of cream or 2 egg whites. If you have a hand mixer, you’d probably use that for tiny amounts. This mixer is your match if you bake loaves of bread daily for a big family or you simply love giving them away to friends. The Artisan mixer have had some bad press in years past. Despite that, sales soared making it the most coveted stand mixer for almost two decades. The trend hasn’t as yet shown signs of flattening or reversing anytime soon. The Knot, a wedding website and magazine, says that it is the most requested wedding gift. In recent years, issues have tapered-off. This is largely attributed to the improvements made by KitchenAid. What makes this KitchenAid model so appealing? To some, the main selling point is the many attractive color options to choose from which may also be one reason a bride covets it. Beyond aesthetics, usefulness is perhaps the biggest reason it ticks. It’s the sweet spot in KitchenAid’s stable of mixers. It is perfect for the beginner or the hobbyist baker with more than enough capacity to spare for more baking later. It also suits someone who regularly feeds 4 – 5 persons or bakes on occasions and Holidays. But, it is not made for frequent use on dough. The lasting fame of the Artisan KitchenAid also attests to its efficiency and quality performance, otherwise, people won’t continue coveting and patronizing it. The Pro 6000 HD is originally a Costco exclusive. It is among the best because it is top value-for-money. If you are looking for a bread mixer that tackles difficult kneading sans the high price, look no further. This one has an efficient 1.0 hp DC motor but costs almost the same as the Professional 600 which has a less powerful AC motor. It’s less of a workhorse than the 7-quart Pro Line but more robust than the Pro 600 mixer. Is 7 quarts too big for you? If you want a 6-quart machine that is as quiet and runs as smoothly as the Pro Line, you won’t find one this cheap. It is designed for the advanced baker who regularly prepares cookies, pizza and bread in large quantities, or several recipes of cakes in one batch. It’s a bit difficult to find accessories like pouring shield or a smaller bowl that will fit this mixer. In fact, it does not include a pouring shield. You cannot use accessories like bowl and beater designed for other models, but you can use all KitchenAid attachments. The Pro 600 series is for someone who wants a mixer that is less expensive than the Pro Line but can make bread daily. It is also suitable for the Artisan user who caters to a family of 4 -5 with more than enough capability to handle big volumes during birthdays, Christmas and other gatherings. Go to the full review. It is equipped with features like motor protection and speed control because it is designed for tough jobs. With 575 watts of power, it is able to move stiff dough around efficiently. The proprietary spiral dough hook design is specially made for kneading dough. Although it is purposed for more difficult mixing and big volumes, it creams a cup of butter or whips a cup of cream just as well as the Artisan. It comes in second to the Artisan mixer in range of color options (24) to pick from. Noise is its main downside. Although this is not entirely a deal breaker, don’t expect to converse with your kitchen companion comfortably while it’s running. Turn it off or yell. The Classic Plus performs as well as the Artisan making it another value find at less than $200. Where it falls short is in the little conveniences afforded by its bigger siblings. The 4.5 quart bowl has no handle and it does not include a pouring shield. But, it is not a significant turn-off if you only prepare 1 – 2 recipes of cake or one recipe of cookies or bread. This is a wise choice if you are a beginner, someone who bakes small quantities, or use your mixer infrequently. You’ll get performance and efficiency at a low cost. And, you can make bread, too, provided one loaf at a time once a week. Choosing a stand mixer is not as straightforward as you may believe. There are a number of factors to consider. Following is the standard we used to pick the best KitchenAid countertop mixers. Given that a good stand mixer is not cheap, some advice say that it should be able to do what you want for it to do. Considering that every mixer model is designed for specific tasks, we believe that it should be able to effortlessly do what it is designed for, and occasionally perform tasks beyond its central purpose. A stand mixer should be able to blend thoroughly and uniformly with little or no scraping needed on your part. If you bake loaves of bread for family and friends daily, you will want a mixer with enough power to plow through stiff dough with ease without wobbling or straining or shutting down. A good bread mixer is expected to produce properly formed dough, but it should also be able to work a box of cake mix or whip a cup of cream decently. Similarly, a mixer designed for light to moderate tasks should be able to whip fluffy egg whites in no time or cream a cup of butter excellently, and also be able to make bread dough properly even if rarely. Bowl size is a metric you have to consider carefully. A bigger bowl is not for everyone. A cup of butter will spread thinly on a 6 or 7 quart bowl and it will just hug the bowl surface making it difficult to blend. On the other hand, a small bowl filled to capacity won’t be enough to hold your ingredients once you begin adding nuts or fruits. If you are going to get a big mixer, choose one for which you can buy smaller bowls . Here is where the Pro Line, purposed with smaller 3-quart and 5-quart bowls, proves advantageous. All the power in a mixer can prove inconvenient if you have to deal with ingredients flying around leaving you with a big mess to clean. This is when a “Soft Start” feature proves helpful. It starts the mixer slow even if you happen to pull the lever to a higher speed. Most powerful mixers of KitchenAid have pouring shields. It helps contain ingredients in the bowl instead of them splattering everywhere. Some flour or sugar will hit the beater when adding them while the mixer is running. Without a pouring shield, they’re sure to fly at you and on the counter and mixer. A handle on the bowl is a convenient extra. It provides better grip and control and makes transferring batters a lot easier. You’ll find this helpful if you have weak hands or wrists. A KitchenAid stand alone mixer is either a tilt-head or a bowl-lift. This mechanisms give space for manual mixing or scraping or for removing or attaching accessories and bowl. Find out in this article which compares these two types of “lifts”. All KitchenAid standing mixers include the standard beater, dough hook and whisk. Where they differ is in the design and material. A spiral dough hook is better at turning dough around the bowl than a C-hook design. An 11-wire whip gives volume to egg whites and creams quicker than the 6-wire whisk because it incorporates a bigger volume of air with every spin. Coated accessories may chip-off, while burnished types may oxidize. Observe appropriate precautions for either. A metal bowl is lighter, durable and more convenient. A glass bowl is elegant but heavy. Consider the load you’d have to lift when it has content. Your choice of a KitchenAid stand mixer will depend largely on your needs and budget. What type of baker you see yourself going forward should also be part of the picture. Pick a mixer that is at least a size bigger than what you presently require. Consider that costs do not vary much from one model to the next bigger model. If you still can’t pick a stand mixer from this selection, see our full comparison of all KitchenAid stand mixers. Or, have you chosen one? Let us know in the comments below. If you have questions, don’t hesistate to ask. We’d be glad to help. -Will 25 watts make a huge diff ? I make a lot of bread dough weekly. Say, 3-4 times per week ? I think this is what ‘kills’ my machines. I’ve sent one away. I’ve tried to ‘fix’ the second one myself. The 3rd one limps along with NOISILY. I know it’s grinding down to nothing. No long-term luck. I might consider 300-350-400 USD range if it will last longer than a year. Or, KA extend their warranty. Or use métal insted of plastic. It NEEDS to fit under my counter. Lift-bowl too tall. Can you make an alternate brand recommendation ? Provide insight on WHY so much plastic ? (Beyond the obvious: money, honey.) And answer the Q’s above ? Thanks ! The Artisan is not a bread mixer. If you make a lot of bread dough, it’s always gonna go bust. Unfortunately, all KitchenAid bread mixers are bowl-lifts. I haven’t done research on the Bosch Universal Plus, but those who have it claim it’s a bread machine. It’s 800 watts and has a 6.5-quart bowl. Big capacity. It’s within your price range and short. I was lucky enough to get the classic series as a Christmas gift this year and have fully jumped into baking since I know own this beautiful piece of machinery. Its held up great although I always cringe making dough praying I don’t over do it. Great information. Just a note about the Canadian market – the Professional 6000 HD sold at Costco here is marketed as being 1 hp but is only 350 watts (stated on the label on the bottom of the machine). I purchased one but recently returned it because it was cutting out when I made larger batches of buttercream (10 cups of icing sugar). I ended up buying the 600. Thank you for sharing your experience. I’m glad you found useful information in our site. Indeed, some people pointed out in reviews that the Professional 6000 HD is just 350 watts. 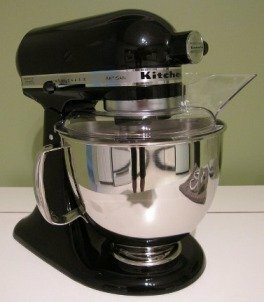 I contacted KitchenAid about it for a detailed review I recently posted: http://mixitbakeit.com/kitchenaid-professional-6000-hd-review/. In it I discuss about the 350 watts issue. So, how is your Professional 600 doing? Is it able to move 10 lbs. of sugar without cutting-off? Thank you for putting this together! I’m planning on getting my first stand mixer in the next day or so, and your blog has been the only place I’ve found on the internet with explicit specs comparing the models side by side. You can’t go wrong with “more” power. Better to have “more” now than need “more” later and you don’t have it. Glad that this blog helped you make a decision. Proline series seems unavailable in malaysia. Is it known by other series. Eg. Ksm 7586 . Please advice for i need to get one for my mum. Pro Line is Model KSM7586 in the US. Model numbers tend to be different in some countries. Are you buying from the US? Please check if you have 110V or 220V in Malaysia. US models are 110V. You can buy a step down transformer if use 110V in a place with 220V. 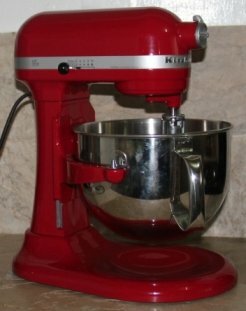 I’m planning on getting a KitchenAid and am leaning towards Artisan – wonder what’s the smallest quality I can do in it. I assume you mean the smallest quantity? You can do 1 cup of cream or 1 egg white on it. Can I use the Kitchenaid with 220 v? I live in Argentina. The KitchenAid models discussed in this blog are rated 110V and can’t be used with 220V. However, there are KitchenAid Artisan mixers which are 220V, but they are more expensive. See here. If you want the 110V, one option is to buy a step down transformer. That’s what a friend of mine who moved to Australia did. I would really prefer to have the stainless steel beaters but I do not want to pay the premium for the commercial mixer. Pro-line has nominally the same size 7qt bowl. Do you know if the bowl shape and the the spindle connector are actually the same? I am thinking of buying the “commercial” stainless steel beaters separately. I’m glad we can be of help. I contacted KitchenAid, and they said that the stainless steel accessories for the commercial model do not fit on the 7 quart Pro Line series. When you have made a choice and have purchased a KitchenAid stand mixer, it will be good if you can share what your bakin’ and how your mixer is doing. Hi Renee, I’m tossing up between two models and need some advice regarding power. I want a workhorse that can handle lots of bread dough for years to come. The KitchenAid website says the Commercial model 5KSMC895 has 325 watts, while their Pro Line model KSM7581 has 500 watts. Does this mean the Pro Line is actually stronger than their commercial model? I find that hard to believe. How does this all pan out on the workbench? BTW thank you for your very well considered blog. Unfortunately, I’m currently reviewing models for the US market, hence, it’s the first time I encountered the models you mentioned. But, I tracked them in the KitchenAid Australia site. I also find it hard to believe that the 7.6L commercial model has lesser power than the 6.9L Pro line series, yet it is more expensive. Something might be amiss. But, the 6.9L commercial model KSM7590 has 500 watts, same as the Pro Line. However, KSM7590 has all stainless steel accessories, while Pro line has coated beater and dough hook. If I will choose between these two, I’d go for stainless steel accessories. If you prefer the 7.6L, I suggest you call KitchenAid to verify the wattage. Higher wattage, more powerful. I’d choose more power and cheaper, too. Thank you for this website! I have been doing much research on purchasing a kitchenAid mixer and this is the best informative web page that I have come across. Always a pleasure knowing our visitors find value in this site. Do you have any insight on the Pro 600 mixer at Costco? It has the glass bowl like the 6500 as opposed to the metal bowl as shown in your comparison. Trying to figure out if the Costco version is a lesser quality mixer trying to look like the more expensive model. Thank you for your help – this is a great site! Could it be that what you saw at Costco is the Professional 600 Design Series model? It has a glass bowl, but is 55o watts. Knowing that this site is helping people encourages us to make it even better. Hi, I just wanted to comment about the various models of Kitchenaid stand mixers. I have not purchased one ‘yet’, but plan on it in the not too distant future, and not before I do my thorough homework. That said, I don’t care what your baking needs are, it is important to have too much horsepower than not. You have to keep this in mind, that you are purchasing an investment that is supposed to last you a lifetime. The cheaper models with their cheaper plastic drivetrain will not give you this, therefore, getting into the professional series models would be the way to go, even if you have to spend the extra money to acquire it. That, you can’t put a price on. Read all the reviews on line and judge for yourself. I agree, Chris, that it’s better to have more than find out later it’s not enough. I did mention in this article that if money is not an issue, I’d pick the Pro Line (biggest power and capacity among residential use KA stand mixers). However, some folks have a budget and just want a machine sufficient for their needs. And, some are quite happy with the less powerful ones. Wise words from your father. Have not seen any comment about noise level. Have read that some models are noisier than others and that the Artisan is most quiet. How does the Professional HD 525 watt compare? I purchased one but not gotten it out of the box yet. I bake a lot during the holidays and off and on during throughout the year. I do double batches of cookies typically. I used a kitchenaid mixer for the first time ever this year (borrowed from a friend) and realized a few things. I need a pour guard, the tilt head is not powerful enough for gingerbread dough AND I don’t want a white mixer. I also don’t want to spend $500 or more. So, that being said what would be your suggestion for me? It’s good that you were able to try a KitchenAid stand mixer before getting one of your own. I am most comfortable recommending a KitchenAid Professional 600 for you. Firstly, because I use one and I’m making bread with it just fine. Secondly, as of this time, most colors are priced at $350-$400 on Amazon.com. If you want more details, you can read my full review here. Hi – I purchased the 6500 at Sur La Table on sale. Your info says it 1.3hp – the box says 1.0 hp. I now see the 600 at Costco for $280. What is the real difference between these two mixers? – is it worth the extra money for the 6500? – Thanks! Please refer to this post which compares the 6500 vs 600. KitchenAid website, under specifications, says the motor is 1.3hp. The downloadable manual says you can find the power rating in the serial plate. The 8 quart bowl can’t be used with the KitchenAid Pro 600. You would have to get the 8 quart KitchenAid Commercial stand mixer if you want to use 8-quart bowl. Also, I believe the watts/power on the 6500 model is 1.3 hp. Thank you for making this site! This is an excellent comparison! I have a question about the comment you made about getting a 5 quart bowl to use with the 7 quart Pro Line mixers for smaller volume batches – I can’s seem to find a smaller compatible bowl that works with the 7 quart pro line mixers anywhere. Do you know if there is one? Thanks! I found the 5-qt. bowl for the Pro Line series on Amazon. Please follow this link. They have it in the KitchenAid site,too, only more expensive. If you’d like to check it, please go here then scroll down to the list of accessories. I’m glad you find what we put on the site helpful. It’s our pleasure to be of help to our visitors. Thank you for visiting. Thank you for posting this comparative analyses, as it has helped tremendously. I’m happy that this site is helping people. Thanks for the appreciation.